The demise of the family farm has been well-documented: from 6.8 million in 1935 to 2.1 million in 2002. But numbers don’t tell the whole story; indeed, they don’t tell any story at all. For that, one needs to hear from the people involved. Gayla Marty is one of those people, and her memoir is in part the story of how her family came to the decision to get out of farming. The Marty farm, located in east-central Minnesota, achieved century farm status in 1981. During Gayla’s childhood and adolescence, it was worked by her father and uncle. The fact that Gayla’s father worked the farm with his brother was the family’s response to the premature death of her great-uncle Sam and the unsuitability of Sam’s son to take over. Gayla’s father would probably have gone to seminary, but keeping the family farm going was deemed more important—by him and everyone else—than pursuing his own calling. By the next generation, that imperative had weakened. Gayla, the oldest child, had three brothers, two of whom—twins—demonstrated an aptitude for farm work, and it was generally assumed they would eventually take over for their father and uncle. Both boys went to college and studied agriculture, but they ended up getting married and taking other jobs. When the time came for them to step in and take over the family farm, neither was interested, nor was the youngest boy, nor Gayla’s cousins. That old farm was a place where trees had been cut to clear land for farming, but many remained—in woods the Martys owned and around the farmhouse. 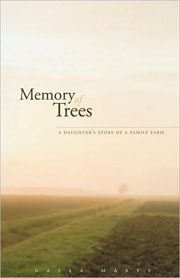 Gayla’s story is interspersed with vignettes of particular trees on the home place, and their resilience and rootedness come to represent Gayla herself as she struggles to find her place in a world without a church-like barn, without cows she knows by name, without the deep connection to a piece of land that nourished and sustained her family for generations. The changing face of American agriculture is a story of land, but it is also a story of families, and this wise and lyrical memoir of one daughter’s story of a family farm is a portrait worth more than a thousand facts. This entry was posted in Uncategorized and tagged summer 2010 on November 19, 2013 by admin.